Paramo says:"P�ramo's latest edition to the Aspira range. This high specification garment range has earned us a reputation for revolutionary design and functionality. Experience, innovation and customer feedback have led to the development of our most technically advanced mountaineering jacket ever, the Aspira. Developed specifically for harsh environments the Aspira offers excellent protection against cold and wet conditions, yet versatile enough to be worn on hotter days in the mountains. The Aspira Jacket allows total temperature control with a multitude of ventilation features and benefits from 25% lighter lining weight." 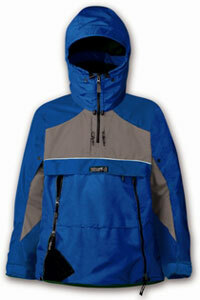 Complete weather protection provided by the fully adjustable, wired roll-away hood. New higher volume hood fits over all types of helmets and is adjustable with cordlocks. Easy and secure use of navigation equipment by one 'Fast Access' chest pocket. Adjustable venting and temperature control through P�ramo's unique upper arm vents. Less abrasion or damage through stronger forearm, elbow and shoulder fabric. Further temperature control and weather protection from P�ramo's multi-adjust cuff design which also allows sleeves to be rolled up for cooling. Now 25% lighter in lining weight! The Paramo Aspira is a stylishly designed outdoor jacket aimed squarely at the serious outdoorsperson venturing into harsh environments. Warm and waterproof, this smock style jacket has an almost bewildering array of vents and zips to control your internal temperature. The arms have poppered, zipped vents for rapid cooling and the two side vents open virtually up to your armpits to permit a high degree of temperature control without having to remove a rucksack or backpack. The front has three pockets, two high up with Velcro flaps and toggles for storing you compass, GPS, whistle and small torch. A larger pouch type pocket in the front easily accommodates your map and walk route guide. The back is long to protect the lumber region and ribbed to support your rucksack. Oh - and like all Paramo garments of this nature - it is waterproof. Superbly waterproof. Technical performance (breathability, waterproofness, windproofness) of the Paramo Aspira is is superb. Good temperature control via the generous vents. Easily stowable. Smock style may not suit everyone (though a 'zip-up-the-front' version is available) and I initially found myself absent-mindedly opening the side vents thinking they were pockets. Price might be a bit steep for some - but well worth it if you walk regularly and want to stay dry.